Three players finished the week with 8 points in Week Nineteen, but the tie-breaking process became very easy, when two of the three were goalies and Ryan Getzlaf of the Ducks was the only skater remaining, him and his 2 goals easily took the first tie-breaker. If the Ducks are going to make a big season out of a slow start, it will be on the backs of their superstars, including Getzlaf, who is finally finding his legs in this 2016 season. In all four games this week, he had some combination of goals and assists that gave him 2 points in each game. A goal and an assist in Pittsburgh, 2 assists in Philly, 2 assists in Columbus and then another one and one in Chicago and that was just the start of their road trip this week. His overall totals are still under the shadow of a very slow start to the regular season, as Getzlaf only has 6 goals and 42 points in 50 games this season, ranking him 63rd overall in pool scoring. Expectations are usually much higher for him, as he has been a 1st round-type player in years previous. This year, expectations may not have been quite as high, as Allan took him at the end of the 2nd round of the draft, 51st overall, but even still, his ranking is for a 3rd rounder and he was certainly in a position to be a bargain pick in the draft at 51st. On the plus side, the scoring race is so tight, the difference between him and 51st overall... 2 points. I guess, we can't make a mountain out of a molehill can we? Not unless I wanted to get into mainstream media, that is. Allan's team didn't make Mover & Shaker this week, but on the shoulders of Getzlaf's big week, his team did bump up a spot, moving up to 13th overall in the standings, still 42 points back of the money and only making up 1 point on 3rd place in the week. A goon team in the Mover & Shaker of the week nod? Has this pool gone mad? What kind of bizarro world is this? Yes, Derek & Dan's team, declared a goon team at the Week Nine Waiver Draft, opted to switch their major at the Week Eighteen Waiver Draft, just as their big guys were getting healthy and productive again, trying to save a little bit of face in the standings, yet keep their edge for a shot at some money this week with their pugilists. 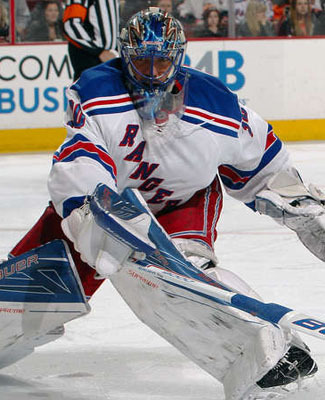 The goons were helped out by their number one pick in the draft, Henrik Lundqvist of the New York Rangers, who has been operating at a very steady click these days, with the Rangers holding down the 2nd spot in the Metropolitan Division and remaining steady there. Lundqvist was one of the three players in line for the Player of the Week nod, having 8 points, really helping to carry this team along. Other notable players for this band of hooligans, Justin Abdelkader of the Red Wings had 5 points and Evander Kane of the Sabres had 4 points. Both players are 60+ minute players in the PIM pool as well, which makes them double-trouble kind of players. Three active players on their roster were without points in the week, which meant their nickel & dime players were more about the dimes, which is a definite plus. The pool's newest duo did shimmy their way up a couple of spots in the pool standings, as they should have, moving up from 18th to 16th in the standings this week. It was hard to argue that their team wasn't all that good to begin with, they were handed a pretty rough start to the season and now they're making up for it, despite having goons like Chris Neil and Zack Kassian on board. Oh, did I mention, they'll also get another mention later on here in the blog post? It's true. Now, this is what a goon team should be all about. Sacrificing points for penalty minutes! Really taking a swing for the faces... errr... I mean, fences. No, faces. Definitely faces. Wes and his PIM pool leading band of thugs only earned 12 points in the week, earning them their first honours as the Basement Dweller this season. Actually, I think it's quite the achievement that their first didn't happen until after the second Waiver Draft of the year, when he really made that push for more minutes, by dropping Nashville's Mike Ribeiro in the process. Way to go, Wes! James Neal of the Predators and Jacob Markstrom of the Canucks made up half of his team's total points, as they had 3 each in the week, while Steven Stamkos of the Bolts had 2 points. His newest goons, Zac Rinaldo of the Bruins and Mark Borowiecki of the Senators picked up 15 PIM and no points... mission accomplished! Now, Wes' team is on the verge of closing the gap between his team and the bottom two teams, as his gap shrunk considerably, since those two teams made efforts to get out of the pool basement in the Waiver Drafts and now Wes is only 1 point up on 26th and 10 points up on 27th. Sadly, there's no bobblehead for last place this year. There is a bobblehead for 1st place, however, and Jeremy has retaken the lead, if only by the margin of 5 more goals than Brenda & Seward at the end of the week. Both teams are locked in at 459 points at the end of Week Nineteen, 23 points up on John P., who may has been staying steady there for the last couple of weeks. John now has a 14-point lead on Neil and a 17-point lead on Kristy & Don, while Stuart's team fell off the pace a little bit, dropping to 19 points back. Some of these gaps would be better served to be a bit smaller, making this section a little more exciting, but we still have eight weeks of hockey left to play. Lots can happen! Did I say lots can happen? That's not what can happen here, as Ryan's team continues to dominate, thanks to a 9-point week from his freshmen, increasing his lead to 53 points and really making this portion of the Newsletter moot. I'll tell what's not moot! Derek & Dan really gooning it up in Week Nineteen as well... points and minutes?!? What the hell?!? Thanks to a big effort from Evander Kane in Buffalo, Derek & Dan's team finished with 71 PIM in the week as well, closing the gap between his team and Wes' by 38 minutes and they now sit only 20 minutes behind. Now, we have a race! It was a pretty good week for the pool, scoring was good overall, as the pool picked up a season-high 679 points in total, but the average per NHL game wasn't quite as high as the records this year, but I'll take one for the other. Skater games were down slightly, goalie minutes were way up and the pool tied the average for PIM in the NHL schedule, setting a new season-high for weekly minutes with 616. One big injury to note this week, as Flyers defenseman Michael Del Zotto is going to be out for weeks, according to the team's brass over the weekend, as he suffered an upper-body injury, believed to be his wrist or his forearm, involved in a pretty big collision around his own net. Details were few and far between, but they will come, the Flyers have been very good for releasing that sort of thing, but now we wait to see if Del Zotto's regular season is over or how much he can still take part in. Grant's team is nearly past Wes' in the standings, thanks to a week that was nearly Mover & Shaker worthy as well, as his team picks up their socks and will have to continue to do so without Del Zotto going forward. It didn't sound too good, but now he's stuck with him. Stick a Fork in Ramo, He's Done!